Monday – UK – Gross Domestic Product slowed to 0.2% in the December quarter, while the annual pace edged down from 1.5% in the September quarter, to 1.3% in the December quarter. Uncertainty over Brexit weighed on business investment. Monday – UK – Industrial Production contracted 0.5% in December compared to the previous month. The decline is primarily attributed to a 0.7% fall in manufacturing. The Australian sharemarket slipped 0.2% yesterday, as the big four banks weighed on the local index. 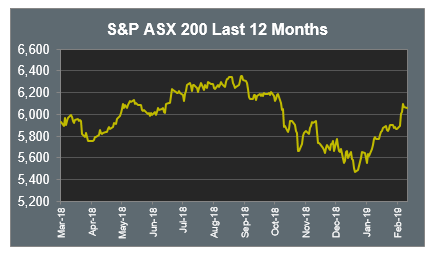 However, despite the fall, the ASX 200 remains above 6,000 points and near four month highs. The Materials sector was the strongest performer, as mining stocks continue to benefit from a continued lift in iron ore prices, which rose 4.1% on Friday. The metal has now jumped ~18% in the past fortnight, following a mining accident in Brazil, which is now responsible for close to 160 deaths. BHP ended the session 2.0% higher, Rio Tinto gained 1.8% and Fortescue Metals rose 3.5%. JB Hi-Fi rose 1.5% after announcing a solid first half year result. Net profit rose 5.5% to $160.1 million, while total sales of $3.8 billion beat expectations. Online sales rose 21%, however, the company warned same stores sales growth had slowed in January as the trading environment has become more challenging. The reporting season continues this week, with Transurban (Tuesday), Aveo, CSL (Wednesday), AMP, Newcrest Mining, Telstra, Woodside Petroleum (Thursday) Baby Bunting and Medibank (Friday) among those companies due to release their earnings. The Australian futures market points to a 0.4% rise today, being driven by mostly stronger markets overnight. European sharemarkets rose on Monday. Italian banks drove the FTSE MIB 1.2% higher, after data showed their capital ratios met European Central Bank standards. The broad based STOXX Europe 600 rose 0.9%, the German DAX climbed 1.0% and the UK FTSE 100 added 0.8%. US sharemarkets were mixed on Monday, weighed down by weakness among Communication Services and Health Care names. Trading was subdued as investors continued to remain cautious ahead of this week’s resumption of US-China trade talks, along with the prospect of another US Government shutdown on Friday. By the close of trade, the S&P 500 and NASDAQ had both eked out a 0.1% gain, however, the Dow Jones slipped 0.2%. 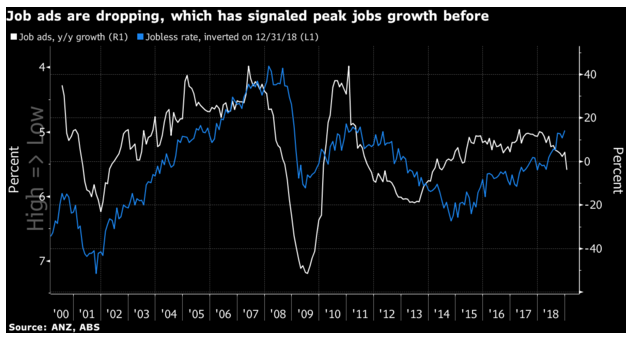 It’s been one of the few bright lights of the Australian economy for some time, but if the fall in job ads follows previous trends, the unemployment rate could also start to climb. As the graph below illustrates, falling job ads have preceded rising unemployment in previous cycles. Given the broad range of data already reflecting a weak Australian economy and the fact the job market is a lagging indicator, a more serious slowdown may already be upon us. Should you wish to discuss this or any other investment related matter, please contact your Investment Services Team on (02) 4928 8500.